Quercus stellata. leaves. ©2009 Will Cook. Carolina Nature. carolinanature.com (Accessed 2017). Quercus stellata is a tree to 16 m; 30 cm dbh; white oak group (subgenus Lepidobalanus), twigs hairy, bark brownish, rough, shallowly fissured, older bark with rectangular blocks, roots associated with ectomycorrhizal fungi (Decker and Boerner 1997). Leaves alternate, to 15 x 10 cm, leathery, young leaves brownish hairy older leaves shiny above, gray to brown hairy below, 3-5 lobes in irregular cross shape, wide at top, lobes rounded, stalks hairy. Flowers monoecious, green, male catkins, female flowers 1-few. 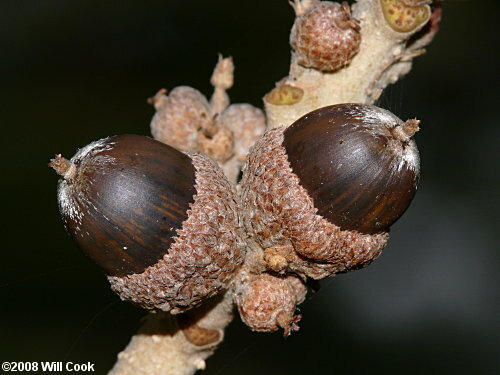 Quercus stellata mature acorns. © 2008 Will Cook. Carolina Nature. carolinanature.com (Accessed 2017). Fruit acorns stalkless, to 1.5 cm, cup covering half nut. Habitat: Upland, dry, rocky soils and sand barrens, soil pH 4.8-6.5 (USDA, NRCS 2010). Tolerant of salt, drought. Intolerant of flooding, soil compaction, shade, index 2-4. (Wood 1938; Hightshoe 1988). Quercus stellata winter buds © 2008 Will Cook Carolina Nature. carolinanature.com (Accessed 5/2017). Notes: NYC is close to the northern limit of post oak. Quercus sp. 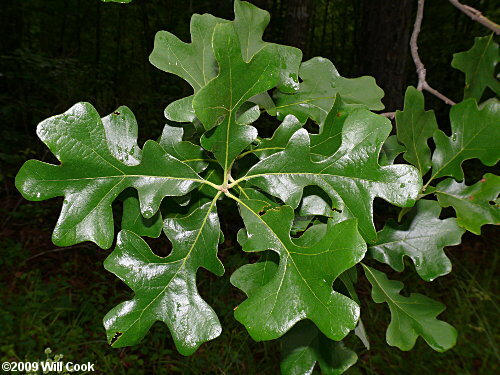 in the white oak group are generally more drought tolerant than those in the red oak group (LeBlanc 1998). Similar range and in habitat to Q. marilandica. Effected by most of the same diseases and insects that attack white oak. 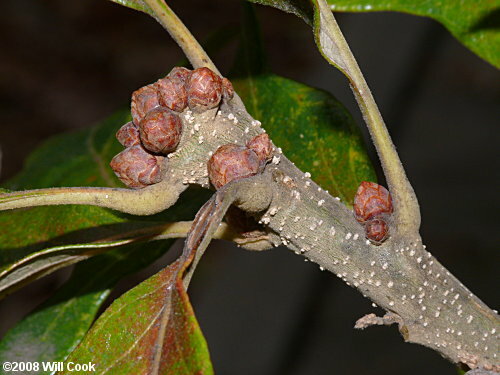 Also infected by chestnut blight fungus, Cryphonectria parasitica, which can cause defects and death.